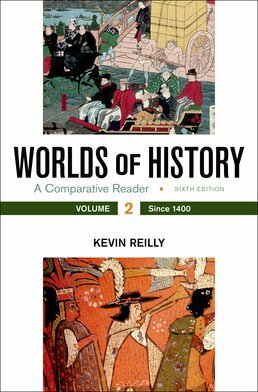 Worlds of History offers a flexible comparative and thematic organization that accommodates will help you learn to make cross-cultural comparisons. Thoughtfully compiled by a distinguished world historian and community college instructor, each chapter presents a wide array of primary and secondary sources arranged around a major theme — such as universal religions, the environment and technology, or gender and family — across two or more cultures, along with material that will build your capacity to analyze and interpret sources. Both China and Europe set sail for global expansion in the fifteenth century, but China’s explorations ended just as Europe’s began. What were the factors that led to their similar efforts yet different outcomes? We examine primary and secondary sources in search of clues. European encounters with Africans and Americans were similar in some ways, yet markedly different in others. The cultural clash created a new Atlantic world that integrated and divided these indigenous peoples. We compare primary source, including visual evidence, to understand these first contacts and conflicts. Between the years 1500 and 1800, the world saw both the rise of empires and religious conflict and war. In this chapter, we ask about the relationship between these two developments and interrogate sources to better understand author, audience, and agenda. With the blinds drawn on the domestic lives of our ancestors, one might assume their private worlds were uneventful and everywhere the same. By comparing different cultures, we see historical variety in family and economic life and the roles of both women and men. The scientific revolution of the seventeenth and eighteenth centuries occurred in Europe, but it had important roots in Asia and its consequences reverberated throughout the world. In this chapter we seek to understand what changed and how. How “revolutionary” was the scientific revolution, and how do we distinguish between mere change and “revolutionary” change? The eighteenth-century Enlightenment applied scientific reason to politics, but reason meant different things to different people and societies. What were the goals of the political revolutions produced by the Enlightenment? A close reading of the period texts reveals disagreement and shared dreams. Modern society has been shaped dramatically by capitalism and the industrial revolution, but these two forces are not the same. Which one is principally responsible for the creation of our modern world: the economic system of the market or the technology of the industrial revolution? Distinguishing different “causes” allows us to gauge their relative effects and legacies. Colonialism resulted in a world divided between the colonized and the colonizers, a world in which people’s identities were defined by their power relationships with others who looked and often spoke differently. The meeting of strangers and their forced adjustment to predefined roles inspired a number of great literary works that we look to in this chapter for historical guidance. Western colonialism elicited two conflicting responses among the colonized –rejection and imitation. Sometimes both cohered in the same individual or movement. Exploring this tension through the visual and written sources in this chapter reveals much about the historical process and helps us appreciate the struggles of peoples torn between different ideals. The First World War brutally ended an era – the world would never be the same after such death and destruction. We read historical accounts and analyze images from the era so that we can begin to understand the war’s far-reaching chain of causes and consequences. The rise of fascism in Europe and Asia led to total war, genocide, war crimes, and civilian massacres on an almost unimaginable scale. How could governments, armies, and ordinary people commit such unspeakable acts? How can we recognize the unbelievable and understand the inexcusable? The Cold War was not only a conflict between the United States and the Soviet Union in which both superpowers avoided direct military confrontation, it was also a series of hot wars and propaganda battles, often played out with surrogates, for the creation of a new “post-colonial” world-order and the control of an emerging “Third World.” A war of words is a good place to look for hidden political meanings. Demands for democracy are on the rise, challenging and sometimes sweeping away old empires, petty tyrants, military dictatorships, and one-party states. Even “old” democracies are pushed to raise the bar to include social justice, economic opportunity, and a right to education. Where are these movements coming from? Are they connected or coincidental? Are they for real? Globalization is a word with many meanings and a process with many causes. What are the forces most responsible for the shrinking of the world into one global community? Do the forces of globalization unite or divide us? Do they impoverish or enrich us? We undertake the study of process to answer these questions.